PI: Chris Maio, UMASS-Boston, PhD Candidate. My research looks at coastal changes that have occurred in response to sea-level rise and storminess during the past 4000 years. 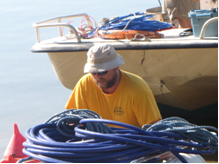 I use a variety of methods including sediment core analysis, ground penetrating radar, GIS, and radiocarbon dating. Learning about how the Waquoit estuarine system responded to past sea level-rise and storminess will provide needed context for understanding and anticipating future changes. 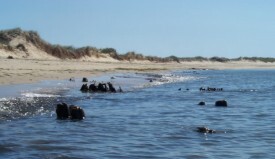 An ancient red cedar forest was first revealed after a series of storms in 2010 resulted in significant erosion along South Cape Beach revealing 111 subfossil stumps along the beach and into the water. Thirteen stumps were radiocarbon dated and ranged in age from ~413-1200 years old. We assume this age represents the time at which the ancient trees were drowned by marine waters. Shoreline change analysis showed that between 1846 and 2008, the shoreline fronting the paleoforest retreated landward by 70 m at a long-term rate of 0.43 m/yr. Sediment cores were analyzed to determine storm and sea level history. Radiocarbon dates of bivalve microfossils indicate that Waquoit Bay was first inundated by marine waters approximately 3600 years ago. The ongoing research will help decipher the relationship between sea-level rise, storminess, and the inundation of terrestrial ecosystems and will help to illuminate what caused the drowning of the South Cape Beach paleoforest.